Hi guys!! Happy Wednesday! First, let me say thank you for allll the love on my last post! I was so taken back by all the messages on instagram, emails and texts that I got. I really appreciate all the kind words and all the good vibes to my lil buddy Griff (he is hanging in there, still not himself, but doing ok!) Second, how are you guys? Hopefully great! My week is SO much better this week, I am pretty sure the full moon or something got me last week! Today I am sharing this most fun striped dress from Intermix (it’s on sale!! And so fun they have their own in store brand now!) Summer is ALL about the blue and white stripe combo and this dress is the epitome of warm temp fun. I fell in love with the tie front and of course the fab detailing. 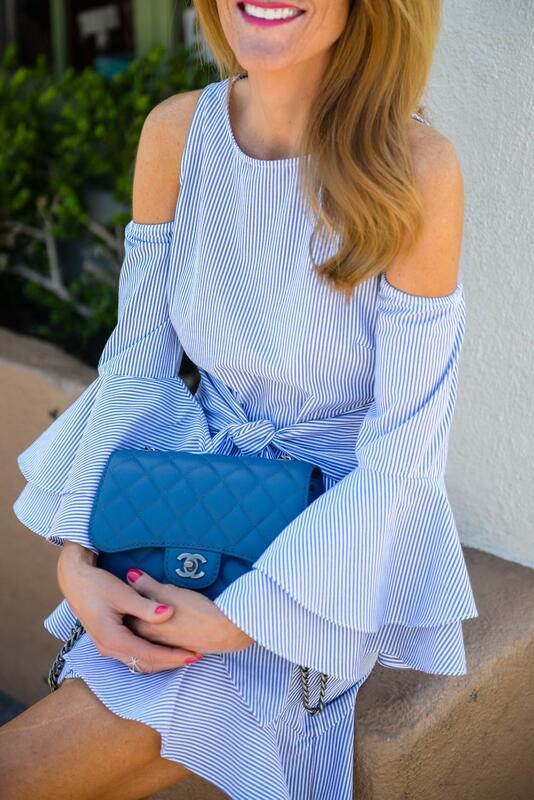 The cold shoulder, the dramatic sleeve and the ruffle hemline all make this dress the perfect mix of Summer trends. It would be so cute for any day of fun (it looks fab with flat sandals too) or Summer bbq. I kept this look so simple since the dress is definitely the hero piece and does all the talking. I went with basic white stiletto heels from Stuart Weitzman (similar option here), circle Ray-bans and my marine blue Chanel crossbody (similar option here and here). I am having SUCH a moment over white sandals by the way. These SW are from last year, but I just got a new pair that I am obsessed.com with (I shared them on insta stories yesterday…eep love love love). I may have to do a whole post on how to style them as I think it’s the freshest way to Summerize your look! I hope you all have a fab fab day! It’s been so warm and sunny here this week, which is honestly such a mood lifter! I am going down to San Diego to do some pics tomorrow, so I am busying around today trying to get it all organized!